Lightweight and compact discs expand into full-size towels when exposed to water. These compact towels are ideal for use during camping, hiking or for emergency survival. Manufactured out of synthetic non-woven rayon these towels are activated with water and can be used wet or dry for cleaning, bathing or wiping down equipment. The towels are reusable. Directions: Expose the towels to water to activate. Squeeze out excess water before use. 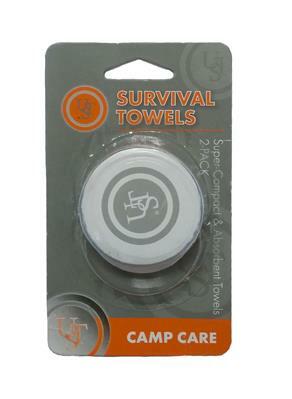 Towel is reusable – after initial use, wring out water and hang to dry.